Tomatoey vodka sauce is one of my favorites and one that I don’t make often enough. 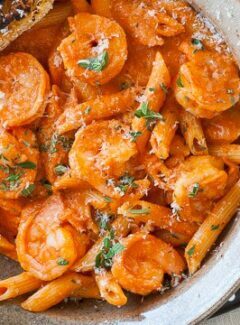 This time I made it and threw in some gulf shrimp to make shrimp penne with vodka sauce. Quite a while ago I did a post on Penne with Vodka Sauce. It’s a tasty but time consuming recipe involving oven baking the sauce for quite a while. 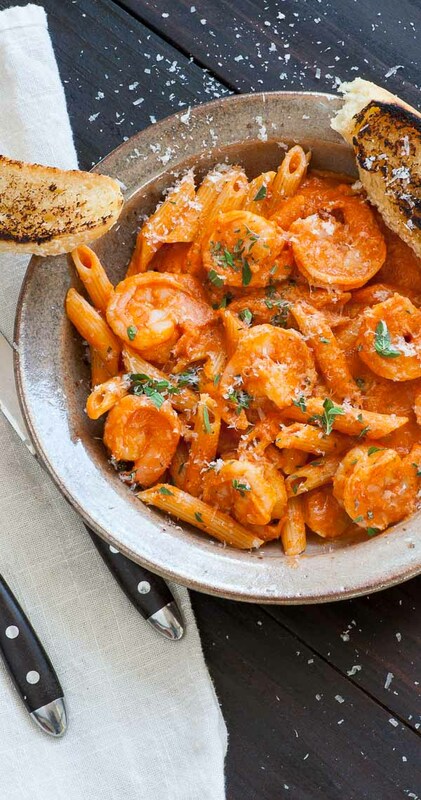 This vodka sauce is similar but with no oven time. Just reduce the sauce for a while on the stovetop. Much easier. The shrimp in this recipe pairs well with the richness of the sauce. And the shrimp is so easy to cook right in the sauce. You should use pretty big shrimp…even if it means you’ll have to peel and devein them. The taste of the shrimp is what makes this a super dinner. If you really like shrimp, you should try the terrific recipe I developed for Bonefish Grill Bang Bang Shrimp. Just like the original tasty appetizer from Bonefish. At the same time that I was making our dinner, MaryJo was baking bread to have with our meal. MaryJo sliced and buttered some of her bread, and I toasted it on the stovetop in a cast iron griddle. The combination of the shrimp, pasta and bread was amazing. 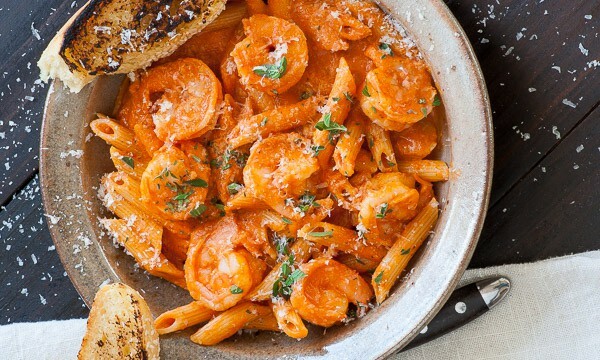 This recipe makes around a quart of penne and vodka sauce which is enough for 4 or 5 people. Since the sauce is so good, I’m saying 4. In less than an hour you and your family could be enjoying this great dinner. Hey. Did you make this recipe? Let me know if you liked it in the comment section below. Also, drop a photo on your Instagram and hashtag #joeshealthymeals. I love seeing what you guys are making. 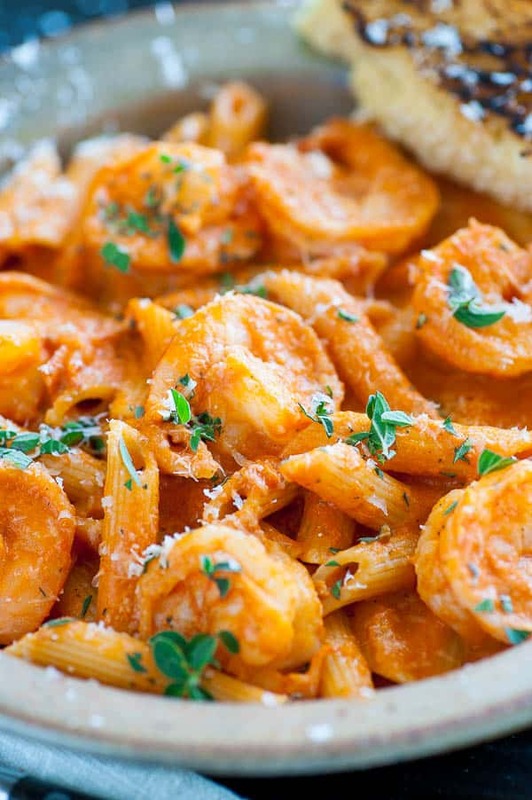 Delicious shrimp with penne pasta alla vodka sauce. The taste is silky smooth. In a large sauce pan on medium heat, add oil, onion and garlic and cook 5 minutes until softened. Add the tomatoes, oregano, red pepper flakes and vodka being careful not to flame the vodka. Stir and simmer about 20 minutes until the sauce has reduced about 25%. 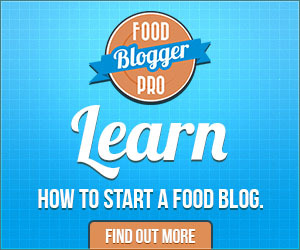 Remove from the heat and use an immersion blender to puree the sauce, (you can also use a blender or a food processor). Put the pot back on medium heat and stir in the cream and parmesan cheese. Taste the sauce and add salt and pepper as you see fit. While still on the heat, add the shrimp and let them cook for 2 or 3 minutes until nearly opaque. Remove the sauce from the heat and let the shrimp finish for another minute, then add the cooked pasta. Stir together and serve hot. Thanks Missi. I just made it again last week too. Great flavors. I’ll be making it soon!! Thanks Joe!! As soon as it is done.. I’ll be back to let you know how it came out!!! Hope you enjoy it Ilsa! Sounds good! I like vodka sauce! Hi Eileen…the vodka sauce is great and the shrimp is very nice with it. OMG–so good I could roll in it!